← We Got a Mutha’ F**king Blimp, Yo! 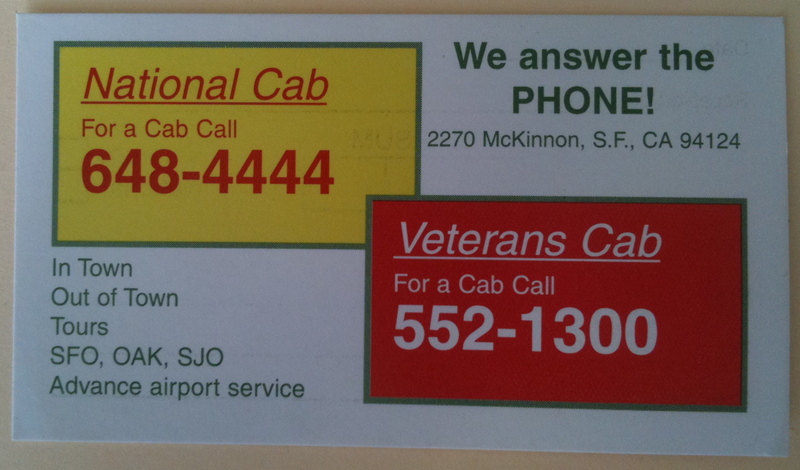 This entry was posted in Background Information and tagged Public Transportation, San Francisco, San Francisco is Weird, Taxi, Taxis. Bookmark the permalink. I like this… I have been in SF for 7 years and always wondered if I was the only person who realized just how weird it is… Just got back from 3 months in Europe and have made plans to move to NYC. I cannot stand SF b.s. any more. It’s so f&*king weird. Oh that and the amount of socially inept/unstable people. Have lived here 5 years and have been starting to get a little restless. When I first moved here everything was mysterious and exciting but somewhere along the way I forgot to stay curious and settled into a routine of the same restaurants, neighborhoods and shops. Thanks for reminding me what a strange city we live in. Yup the taxi situation here is ridiculous. I tried to make a “reservation” for one the other day and the dispatch almost laughed at me. Did they answer? Just curious. It’s frustrating when you realize you could have walked to your destination in that 45 min.